With so many different marketing materials and product packaging out there, it can be tough to tell which products are made in the USA. In this guide, we go over: FTC guidelines for brands who claim their products to be made in the USA, phrasing and imagery to look out for, other best practices for checking country of origin, and debunk some common myths. The Federal Trade Commission, or FTC, is tasked with preventing and bringing action against unfairness or misleading information in the market. Their number one priority is protecting us – the American consumer. Due to the FTC Act of 1914, they are allowed to bring legal action against companies that present any sort of false or misleading information – including claims that their products are made in the USA. Here are the things you need to know about the FTC’s policy around made in the USA claims. In order to advertise a product as “made in the USA”, the FTC requires that the product be “all or virtually all” made in the U.S. Now, that is a pretty broad claim, so let’s break it down. The assembly of the product must take place in the U.S.
Obviously, these two requirements are very vague and subjective, which is why each case is evaluated individually. For example, if the knobs on a grill are imported, they can be considered a negligible amount of a final product and therefore the manufacturer can say their product is “made in the USA” if everything else is sourced as processed here. However, let’s say they import their grill grates too – that part is considered too integral to the final product, which affects their ability to market themselves as “made in the USA”. In that case, they may use an alternative phrase like “made in the USA with international materials” (more on that later). One of the biggest things to know with “made in the USA” advertising is that the use of this phrase is in no way pre-approved by the FTC before a company uses it. It is up to the individual company to determine their compliance with FTC regulations and use made in the USA language on their products and in their marketing. This part of the regulations is particularly scary, and one that you have to keep in mind when shopping. Look for supporting evidence to their claim – do they have content, images, or videos from their American production plants? Do they list other information about the country of origin of their materials? These signals (and our other tips below) can help you substantiate their claims. There is zero formal system of proactive review by the FTC against made in the USA claims. They only launch an investigation if there are allegations or complaints brought against a certain company. From their, they can investigate and form a lawsuit. While the lack of pre-built systems here is somewhat alarming, the FTC has done a good job at cracking down on some major brands over the years on these types of claims. This is especially true when we as consumers raise our concerns as a community. The power is in the people! However, the lack of structure here is not particularly helpful when you’re trying to evaluate the legitimacy of the “little guys” – the smaller companies that typically fly under the FTC’s radar. Overall, the FTC guidelines are meant to protect consumers, but don’t catch every violation out there. Use our tips below to help spot the real American made products yourselves while you’re shopping. Words matter. Here are a few common phrases used in marketing materials that can mean slightly different things. First and foremost – look for products that say “made in the USA” on their product packaging, website, or other marketing materials. The key part of that phrase: USA. What most people don’t know is that the phrase “made in America” can also include Canada and Mexico, because of our free trade agreement (NAFTA) with those two countries. Look at the verbs that the company is using in their American-made claims. Are they saying “made” or “assembled”? Using the word “made” is typically more all-inclusive of both raw materials and processing. “Assembled” typically means that their production process is U.S.-based, but their get their materials and parts from overseas. In some industries, that can mean a lack of quality, or even worse, health risks. Often times, companies may add modifiers to their made in USA claims because they cannot fully justify only saying “made in the USA.” This is a tip off that potentially a good chunk of their production process is performed elsewhere, whether that is labor or materials. This example below from DeWalt is a good one – they say “made in the USA with global materials,” tipping us off that they are not sourcing the parts for their tools in the U.S.
Just because a product has an American flag sticker does not mean it is made in the USA. These stickers are actually not regulated by the U.S. government, so many companies use them as a “feel good” tactic. The same goes for American flags or other U.S. symbols on the product label – just because they use it doesn’t mean they are producing their products here. This is a pretty obvious tip, but an important one – try to find the country of origin on the company’s website, product packaging, or other materials. Here are some common places where you can find that information. Often times, manufacturers will explicitly state where their products are made in a couple of different sections here. One is in the bullet points at the top of the page next to the product image. 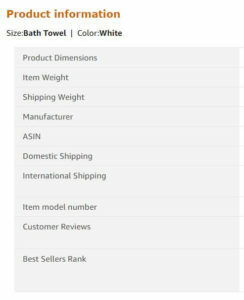 They will also often list “Country of Origin” in the Product Information section further down the page, as shown in the screenshot to the right. Another good place to check here is in the customer FAQs even further down the page. A lot of times, people have questions about where these products are made and other consumers have the answers. If you’re browsing around the company website, they might list their country of manufacturing in a few different places. Check their “about us” or “company story” pages. For companies who truly source and manufacture their products in the U.S., they are typically not shy about saying so. Look for authentic evidence that they produce their products here, like a list of employees, U.S. office locations, or images and videos of their production plant. If you’re shopping around in their online store, check their individual product pages! Under sections like “description”, “specs”, or “FAQs” is where companies typically reveal their country of origin. 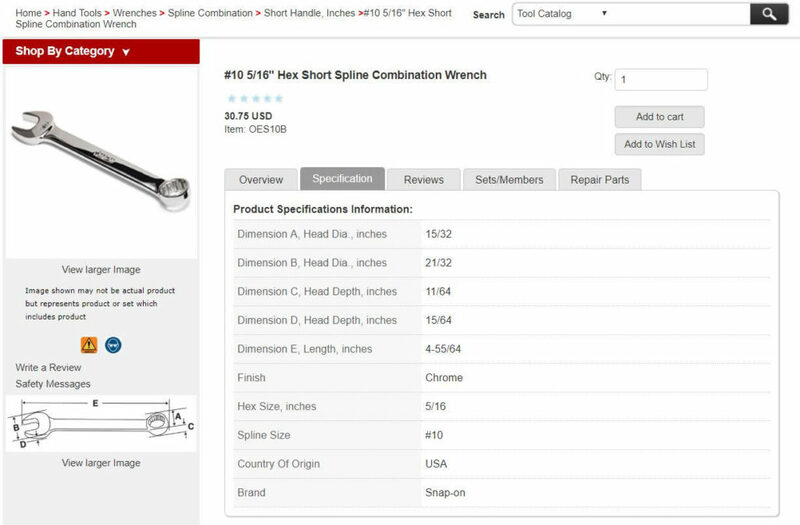 The screenshot below from Snap-On Tools is a perfect example. Often times, companies are not super clear anywhere online or in other materials about where their products are made. That is when a good old fashioned phone call can do the trick. Try to get a hold of someone in the sales or marketing department. Typically customer service representatives are not going to know enough to provide you with a good answer. According to the FTC and other regulations that the government has put in place, there are a few product categories where companies are required to explicitly state the country of origin. These rules are great for consumers! Here are the product categories. These pieces of information should be clearly labeled on your car. According to the Textile Fiber Products Identification Act and Wool Products Labeling Act, most clothing and other textile products that are made in the USA have to be labeled as such on the tag. Labels for stuff that is imported is regulated by the Customs Service. For fur products, the Fur Products Labeling Act mandates that all imported furs must be labeled as such in all of their advertising. There is a common myth that floats around stating that you can tell where a product has been manufactured by simply looking at the UPC or EAN barcode. This is false. All barcodes originate from the GS1, or The Global Language of Business. When a company purchases barcodes from them or another third-party retailer, the barcode indicates where the company originated, not necessarily where the product is manufactured. GS1 issues the first few digits of the barcode to identify them, and then it’s up to the manufacturer to generate the rest of the digits on the barcode as they see fit to help identify their products. Additionally, the GS1 is just a company – not a government agency. We hope our guide will help you make better, more informed decisions about buying American made products. We will continually add to and update this guide as we have new information. As always, send us your feedback, and happy hunting!